In first, please check to wear the Gear Sport correctly. on you arm above your wrist as shown in the figure below. keep yourself warm when checking your heart rate. while taking heart rate measurements. Doing so may cause your heart rate to be recorded inaccurately. • If you receive a reading that is very different from your expected heart rate, rest for 30 minutes and then measure again. cause your heart rate to be recorded inaccurately. skin condition and location and concentration of blood vessels. 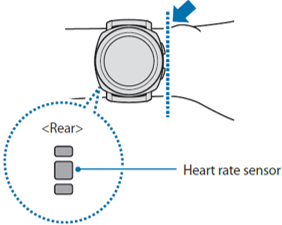 the position of the device’s heart rate sensor to the right, left, up, or down on your wrist, or turn the device so the heart rate sensor sits firmly against the inside of your wrist. evenly. Please make sure you remove such obstructions before use. of the device for a long time may cause skin burn.